Fall for Dance has continued to evolve over the years. Less prominent are the super young crowds, the spontaneous whoops and hollers, and the programming that targeted these. The fare has become moderately more ambitious, less blatantly accessible, and the programs edited to run two hours or less (in early seasons, they were jam packed and exhausting in length). While the zazz and hysteria are gone, the festival is still a terrific sampling of dance from all over, at a reasonable ticket price. I caught three programs. Black Grace, a troupe from New Zealand, performed two works choreographed by Neil Ieremia, displaying strength, precise timing, vocalization, and body percussion. The men, bare chested and muscular in Minoi (1999), embodied the fearsomeness that would surely rank them as dominant among humans. The women, wearing flowing slip dresses, moved more fluidly in the New York premiere of Pati Pati (2009); all joined in the ending. San Francisco Ballet's Variations for Two Couples (2012), by Hans van Manen, included Sofiane Sylve, in a welcome return to New York (in her prior time with NYCB, she exuded the glamour and fervor comparable to current company diva Sara Mearns), with Luke Ingham, Vanessa Zahorian, and Carlos Quenedit. The dance appealed in its simplicity and calm pacing to a varied and atmospheric medley of music by Britten, Piazzolla, and others. A simple straightening of a curved port de bras spoke volumes. 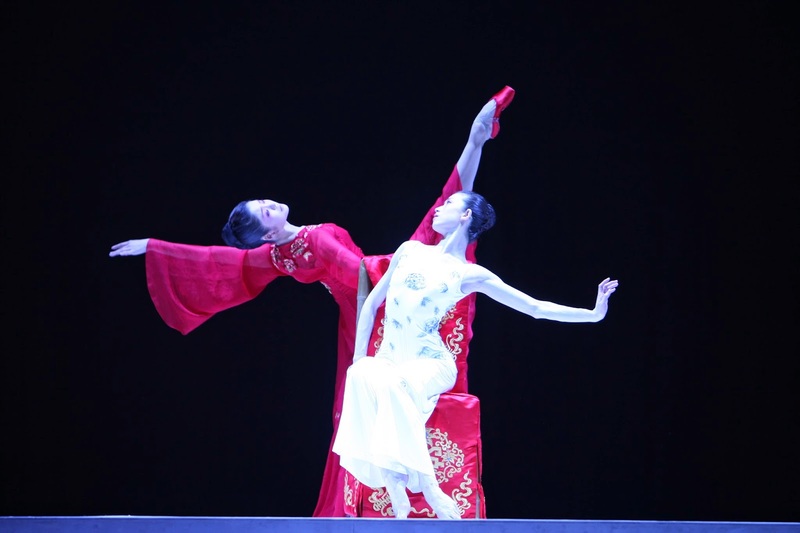 Two stars—Fang-Yi Sheu, lately pursuing independent projects, and Yuan Yuan Tan (a principal with San Francisco Ballet) performed Russell Maliphant's Two x Two (2009). A bit of an oddity well-suited to mature dancers looking for divergent dance vehicles, it was all about Michael Hulls' lighting—two distant boxes, with increasingly bright borders which illuminated slashing feet and hands. The women moved their arms and torsos fluently, writhed, and extended their legs on occasion, but with such eloquent dancers, it was a disappointment not to see more of their artistry. 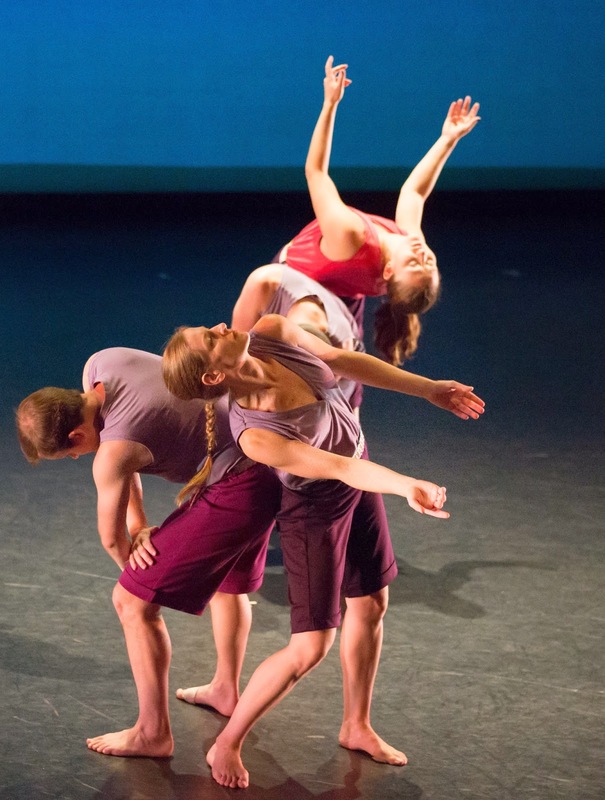 at Fall for Dance, which primarily showcases tried and true works. It was the eve of the company's diverging tours to Europe and Asia. Morris explores the simplest of human moves in this work, punctuated by a silk drop carried cross stage to hide dancers' comings and goings. They wear multi-hued, unisex surplice tank tops and bermuda shorts (designed by Maile Okamura, a company member sadly absent from the stage for this performance), flattering to no one but satisfyingly functional. Morris' movement of course emphasizes the rhythms within the score, sometimes obviously, at other times playfully. Two men gesture conversationally; a pair of dancers take turns curving themselves in attitudes with arched backs around the other. Skipping and spinning looked novel and fun, as if we all might be able to hop onstage and join in, although Morris' dancers are experts at making it look easy. The dancers trudged and leaned on one another, exhausted children, or wound and rapidly unwound their legs, fluttering their hands. They swung invisible baseball bats, and formed lines and then rings of three, tossing their heads gleefully from side to side. Words will be performed by eight dancers on tour; 16 danced here, providing 16 interpretations of innocent pleasures. The third program was all over the place, mixing genres, but feeling jagged and heavy in the process, in part due to the works chosen. 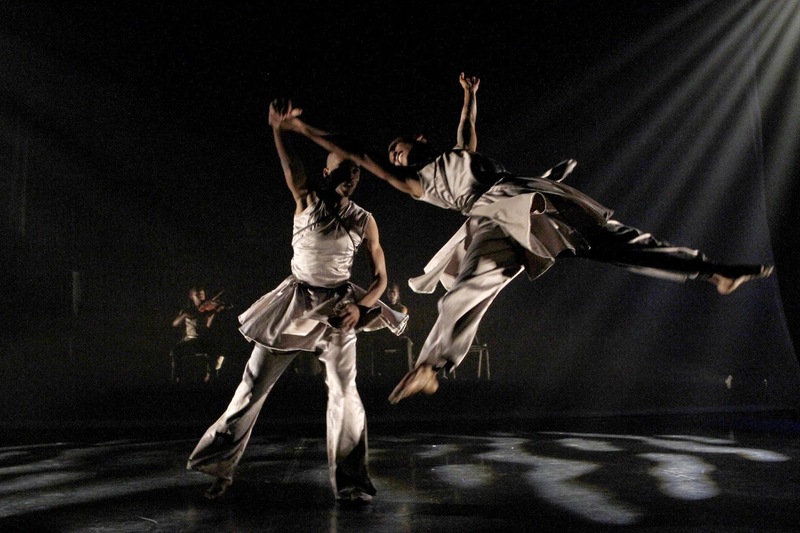 South Africa's Vuyani Dance Theatre opened with Umnikelo (2011), choreographed by Luyanda Sidiya. This admirable troupe spares no effort toward gender equality, which is so far from classical dance's norm. The same shiny white tunics and pants are worn by all members, who have shaved or closely-cropped heads. When the company is not moving in unison, women partner men, lifting and suspending them in the air. The lead drummer is female, extremely unusual. The movement is an amalgam of modern, African, and martial arts, and one or more of the dancers at a given moment join in the vocalizing. While overly long for this program, the group was met with raucous applause in its choreographed ovation. If there could be a more jarring juxtaposition than shifting to Sara Mearns & Co. in Stairway to Paradise, I can't think of it. Choreographed by Joshua Bergasse (agh, Smash, you were too something for this world) this MGM number, with its nine Fosse-esque men giving us their best forced smiles and biggest jumps, features the uber ballerina—well, mainly her nonpareil gams, well-displayed in her tiny black costume with fringe and rhinestones, and capped by sparkly character shoes—stepping on the mens' hands, or being vaulted precariously in the air to be caught in various louche positions. Apart from looking fabulous, Mearns did appear self-consciously showy, which is not typical for her—or at least in this "please love me" manner. Trisha Brown's Son of Gone Fishin' was a tough piece to include in FFD; even for Brown fans, it's among her grittier works. Performed by her company, in a state of transition and uncertainty in the wake of her absence, it felt all the more urgent to appreciate its fleeting moments. But this piece in particular takes a certain state of mind, with its structure: A-B-C-center-C-B-A, and its fractured and at times irritating sound track. It left me impatient while trying to soak it in fully. It was another display of gender neutrality, which Brown has always put forth. Peony Pavilion, by the National Ballet of China, with choreography by Fei Bo was an oddity. This version was adapted for the City Center stage, and focused on the lavish costumes—embroidered silk robes in jewel tones, or modernized interpretations—sheer silk with silver embellishments, and clean black and white costumes. I suppose it was gratifying to get a taste of the company, which hasn't been in New York in years. A glimpse is better than nothing, but it did seem a minor waste to see just 20 minutes of this work. The final program of FFD was another ambitious mix. Wayne McGregor|Random Dance's Far started it off with real drama—four women held flaming torches to light a couple's first several minutes of dance, exiting one by one as the stage lights warmed. To a soprano aria, it felt intoxicatingly romantic. The work extended into several more sections of groups and pairs, lit inventively in a matrix of light squares, or a wash of silvery light. McGregor pushes and tweaks the classical language expressionistically, pushing arches and developpés ever deeper, sending waves through torsos. The music (by Ben Frost) grows snarling and harsh, with wild animals tearing through now and again. I can't decide if it's a utopian or dystopian vision of future ballet. Pontus Lidberg was commissioned by FFD to create This Was Written on Water, a duet for two of ABT's newer principals, Isabella Boylston and James Whiteside, to music by Stefan Levin for a live string trio, and will become a part of Lidberg's upcoming film. Dance is but one creative element for Lidberg, who designed the falling-leaves decor. Harriet Jung and Reid Bartelme, who just performed with Lar Lubovitch last week, created the costumes, which included an elegant jade dress that fits Boylston like a glove. The movement was fluid and pretty, particularly on these two clean-lined dancers, but apart from a flexed foot or half cartwheel, felt fairly unremarkable, and more generic than Lidberg's ground-hugging passages seen in Within. Aakash Odedra supplied the requisite indigenous dance on the bill. A variation on Kathak, Nritta was distinguished by rapid spins, loud stomps, rising on his bare toe tips, and space-eating stage crossings. But the main attraction, and festival closer, was the Sarasota Ballet in Les Patineurs (1937) by Frederick Ashton to music by Giacomo Meyerbeer. It's been awhile since this ballet has been seen in New York. 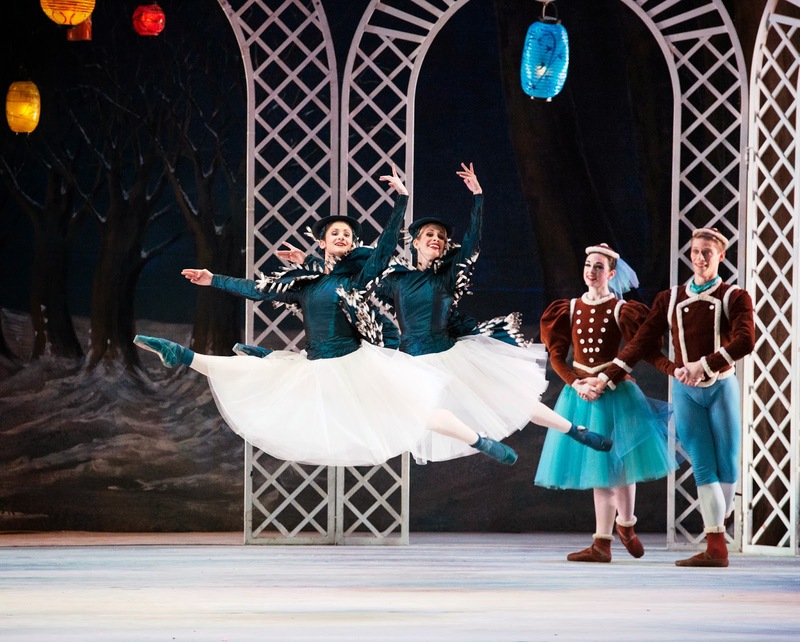 The clever adaptation of skating moves—chassées, spins, backward chugs, even humorous falls—to ballet remains irresistible and innovative. The sets and costumes, by William Chappell, add confectionary appeal, and the young, fresh-faced dancers performed sparklingly. It was a delectable and memorable close to yet another Fall for Dance.